One of the ideas that fascinate me in my electronics projects is minimalism in form factors. Having started out on an Arduino Uno, I started building ATtiny84 (14 pin DIP) based projects after a while, then ATtiny85 (8 pin DIP) based projects. That's where things remained for a while, but eventually, I could not resist the temptation of tinkering with the most minimalist of the ATtiny series: The ATtiny4/5/9/10, coming in a 6 pin SOT-23 package. Despite the modest specs of the series (The ATtiny10, as the luxury high end model, features 32 bytes of RAM and 1K of flash), there is decent compiler support (don't expect to run an Arduino core, of course), but programming the MCUs is a bit tricky. Pulling out the MCU from the circuit and reinserting it for every programming cycle would require rather massive amounts of soldering, and putting it onto a breakout board sort of defeats the purpose of having such a small form factor in the first place. Every pin of the MCU (Except for GND) is broken out to a pin in the right row of headers. The left row is connected to the rightmost row in the prototype area. That way, the two rows of headers can be connected to operate the circuit, and separated when reprogramming the MCU. 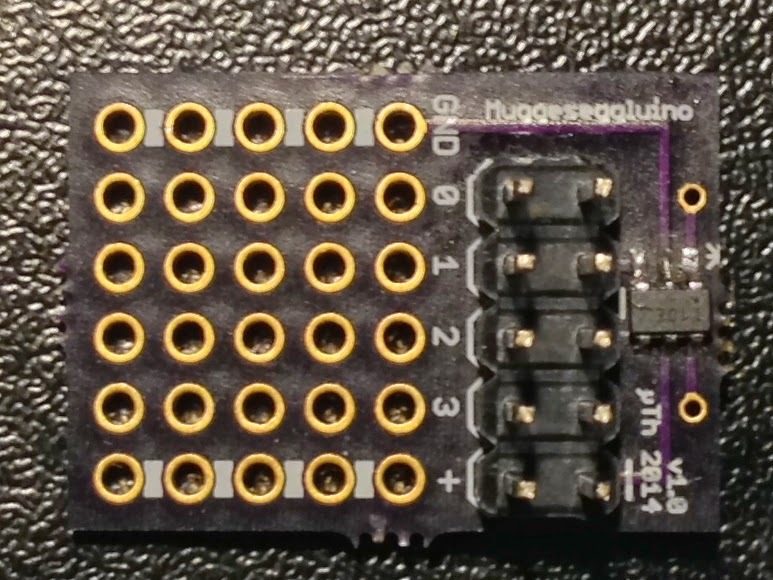 After the software is final, the headers can be removed and the two rows of pins bridged (The astute reader will notice that the space savings over a DIP breakout board, if any, are minimal, but I still like the design). The name of the board, "Muggleseggluino", derives from the Alemannic word for a small but distinctive amount. It seemed an appropriate name for situations where just a tiny bit of microcontroller was needed as an ingredient. Right now, I'm still playing with software options. The easiest solution out of the box is Wayne Holder's ATtiny10 IDE. The high voltage circuit is only needed when using pin 3 as an I/O pin, otherwise, SHDN can be used on the RESET pin directly. If you already have a 12V power supply, the single transistor circuit used by ScratchMonkey should also work.